Are you a fan of Lobster? How about a fan of Red Lobster? Then be ready to be EXCITED because Lobsterfest is back at Red Lobster! · New! Wood-Grilled Lobster & Tacos—A wood-grilled split Maine lobster tail and three lobster-and-shrimp tacos with cilantro slaw, fresh pico de gallo and spicy ranch sauce. · New! Maine Lobster & Shrimp Trio—A wood-grilled Maine lobster tail, garlic-grilled shrimp, and lobster-and-shrimp mac ‘n’ cheese with a white Cheddar and bacon sauce, topped with Parmesan crumbs. Served with wild rice pilaf. · Lobster Lover’s Dream—A succulent rock lobster tail and sweet split Maine lobster tail, roasted and served with lobster and shrimp linguini Alfredo. You can find the full range of limited time lobster entrees available during the 30th anniversary of Lobsterfest here. 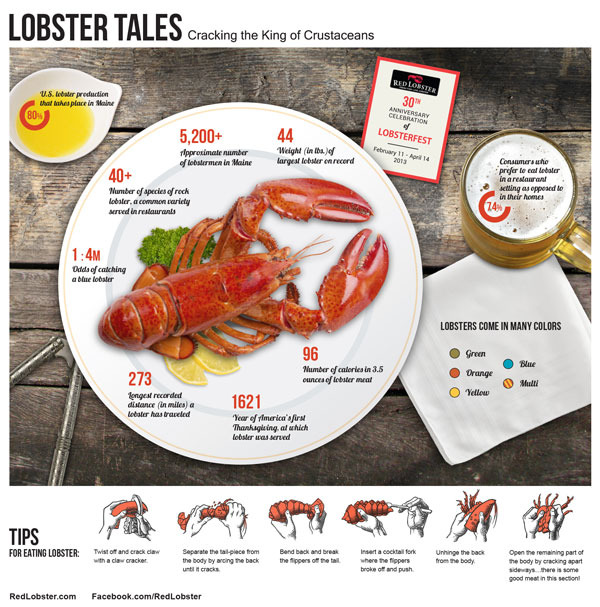 Also, don’t forget to check out RedLobster.com and connect with them on Facebook and Twitter for promotions and special offers throughout Lobsterfest, including free appetizers, coupons, and much more like this $10 off coupon! Craving Lobster lately? Get your fix today at Red Lobster! Hurry though - it only lasts until April 14th!